My mom always marveled at the baby gear items I had for my son. She would always say that they never had all these fancy things when I was a baby. Well, I’m very grateful for the modern baby gears available today. Two things I appreciate very much when my babies were little were my baby carrier when I needed to hold my babies close and a bouncer for a safe play area when mama could get some chores done. If you are planning your baby registry, I highly recommend a baby bouncer and/or a swing on your list. We had both, a swing and a bouncer and I found them very useful. 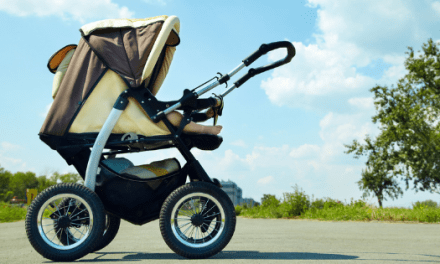 When Can Baby Use A Bouncer? 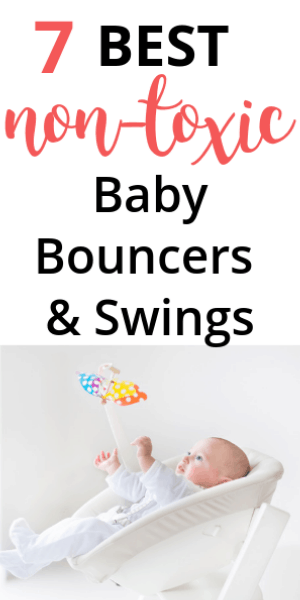 Depending on the type of the bouncer some can be used right from the newborn stage whereas some are recommended to use after a few months. Some bouncers require the baby to have enough head-neck control, which is usually attained around four months of age, for them to be able to sit upright in the bouncer. Whereas, some bouncers come with a newborn insert or lie flat to accommodate a newborn. Always look at the suggested weight range before purchasing the bouncer. There are so many types of baby bouncers available today from all different brands, but it is sad that there are only a handful of safe non-toxic bouncers that are made from quality organic materials. Reclining bouncers are designed with newborns in mind. You can start using these type of bouncers right off the bat, as they fold flat so that your baby can lie safely and comfortably. Some bouncers also come with a newborn insert which offers more head support for newborn babies. 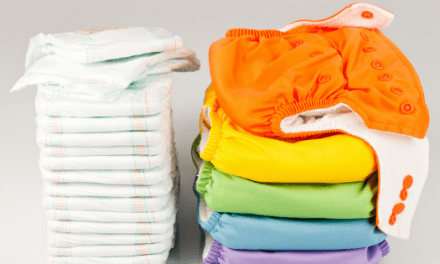 Here are some of the best non-toxic bouncers that can be used with newborns. The Baby Bjorn bouncer now comes in two different models – Bliss and the Balance Soft. The Bliss is the newest model from Baby Bjorn which features the same design as their previous model Balance soft. However, Bliss comes in soft, airy mesh material and quilted cotton fabric. All of the Baby Bjorn bouncers are simple yet have a very striking look. They will be a gorgeous addition to any modern nursery. In terms of operation, Baby Bjorn does not operate on power instead uses the momentum of the baby’s kicking moments to bounce. Baby Bjorn bouncers can be used from the newborn to well up to the toddler stage ( 0 months – 2 years). It accommodates three different positions for newborns to lie flat, infants to sit up and look around. It features a three point harness that is easy to strap and keeps the baby safe and secure. The Baby Bjorn bouncers are one of the most light-weight bouncers in the market making it very easy to carry around the house. It also folds flat making it very travel-friendly. Once your baby is big enough, the bouncer can also be used as a chair by simply reversing the cover. Most importantly, Baby Bjorn only uses fabrics that are Oeko-Tex Standard 100, so you can feel safe knowing that there are no harmful substances touching your baby’s skin. The bouncers also comply with US ASTM F2167 and the EN12790:2009 safety standards. Baby Bjorn bouncers are cozy, comfortable and a safe place for your baby to rest and play. They are uber stylish, sleek and durable. They are worth every penny because of the high standards they adhere to and the quality of materials used. The only con I can think is that the toy bar needs to be purchased separately which can get expensive. The Stokke’s Steps Bouncer is a piece of baby gear that makes me swoon. It is beautiful as well as a very functional bouncer. The features are very similar compared to the Baby Bjorn bouncer. Step Bouncer is also solely operated by baby’s movements by creating a gentle bouncing motion without over stimulating your baby. The bouncer also folds flat for easy storage. Stokke’s bouncer can be used from the newborn stage up to 20 pounds. The bouncer can also be attached to Steps high chair which extends its use-ability beyond typical bouncers. By mounting the bouncer on the high chair, you can bring them up to your level and enjoy meal time together. However, some parents feel that the bouncer is too steep while mounted on the high chair. 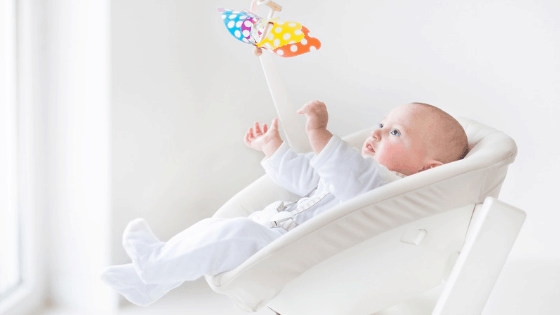 The bouncer can be used in four different positions depending on the weight of the baby. You can secure your baby with the five point harness seat belt. Stokke’s bouncer comes with a newborn insert for extra coziness. Stokke’s developed the insert with Pediatric Physiotherapist to ensure maximum comfort and safety of your baby. The detachable toy bar that comes with the bouncer is also a plus. The bouncer comes in various appealing colors so you can easily pick one that will fit your nursery. If you are looking for a bouncer that offers additional movements and vibrations like the mainstream brands, then the Coco 3 in 1 Organic Bouncer is my recommendation. It has a 2- speed vibration and a 3 recline position for maximum comfort. It also folds flat and comes with a travel bag. The Coco lounger looks nothing like your regular bouncer. The frame of the bouncer is elegant and curvy, made from a single piece of baltic birch wood frame. The seating is made of plush cotton with polyester rear lining. The lounger is a self-rocking system that bounces when the baby moves. It comes with an adjustable 5-point harness for safety. The lounger can be used with the newborn and up until your baby is 12 kgs. Bloom creates its products with safety in mind. The materials used for the lounger are all Low Voc, formaldehyde, MDF and Flame retardant free. The Nuna Leaf is another high-end, durable baby bouncer that is made of organic, Oeko Tex certified fabric. Nuna Leaf provides calming swaying side to side motion when pushed and the motion lasts unassisted for over two minutes. The Nuna leaf is completely manual and is not powered through batteries or power outlet. If you do want something that keeps your baby swaying without your intervention, then you might want to consider buying Nuna Wind. Nuna Wind is a small motor that attaches to the Leaf and helps the leaf swing. The seat has three recline settings, but it can also be locked to stay put while feeding or playing. Nuna also sells a toy bar that can be attached to the Leaf. Nomi is designed as an All in One High Chair that will grow with your baby through all the stages of their life. Nomi Baby is the newborn bouncer seat that is made of Oeko Tex certified mattress. The Nomi Baby looks very comfortable and safe. Unlike other bouncers the Nomi Baby lifts the baby to your level, which makes it easier to tend to your baby while you are working. The bouncer has different recline adjustments, it lays flat for newborns and as your baby gets older you can use it in a more upright position. My favorite feature about the Nomi Baby is that it converts into a high chair and can be used well beyond childhood. 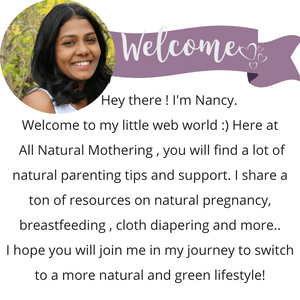 The other options of non toxic bouncers that I have comes across are Charlie Crane LEVO Baby Rocker and Bombol Bamboo bouncer (which unfortunately is not available for US & Canada, but I believe you can get it in Europe). I can’t find the LEVO bouncer in the US as well, if you do, let me know and I will link to it. These kind of bouncers are also called as Exersaucers. These are used once the baby’s feet and reach the floor and have enough head-neck control to stand up. The only non toxic option I have found is the Bobbin Play Centre from Etsy. The play centre sits on the floor and seat is made of leather.The Bobbin conforms to US ASTM F2012 Standards for Stationary Activity Centers and meets or exceeds the safety standards of the Canadian Consumer Product Safety Act. You can mix and match the toys ( sold separately) based on your baby’s interest to keep them engaged. The Bobbin later converts into an activity table or a kid’s table. Light Weight (Yet Strong): You will want the bouncer to be light-weight yet sturdy that it doesn’t tip over. Ideally, you will want a wide base that can support the bouncing motion. At the same time, you don’t want to lug around an insanely heavy bouncer around the house. Battery or Outlet power: Some parents prefer bouncers that only gently bounce and do not vibrate or other additional movements. However, some babies will find vibrations soothing. Portability: If you travel a lot, you will prefer a bouncer that folds flat and fits in your car trunk to use on-the go. Both Baby Bjorn and Stokke’s bouncers fold flat and will make a great bouncer or baby seat for travel. Life Span: Since all the non toxic bouncers on the list are not very cheap, it is wise to get more bang for the bucks you spend. Nuna Leaf can be used until your baby is 130 pounds and it makes a great lounge chair for your kid. While the Nomi Baby coverts into a high chair and can be used well beyond childhood years. Extras: Extra features like an attached toy bar or a newborn insert for those early days can be nice to have. How Should I Use A Baby Bouncer? Baby bouncers are typically used for shorter periods for your baby to rest or play. Every bouncer will come with a manual along with instructions on how to rest your baby as per the age and weight of the baby. 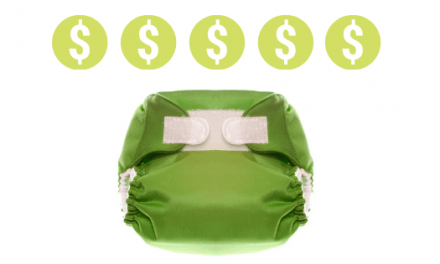 Get to know whether your bouncer can be used for newborns. Bouncers that can be used with a newborn comes with an almost flat recline position. Once your baby is in the bouncer make sure to secure the safety belt. Supervision is required while your baby is on the bouncer. Sleeping In A Bouncer: Yes or No? Bouncers are not indented for sleeping. My son loved to doze off in his bouncer, so I would put him in the bouncer and rock him to sleep, but I will transition him to the crib once he has fallen asleep. How Long Should A Baby Stay In A Bouncer? Not long! It is advised to use the bouncer for short periods instead of using them for hours. Strapping your baby in a restricting gear like a bouncer for prolonged periods can develop flat head syndrome. It is advised not to use baby bouncers for more than 20 minutes at a stretch. Personally, I have had only one bouncer. If you live in a two storey house, you may lean more towards having two (one for each level). Personally, I would only have one bouncer and have a swing or a play yard if I need another safe play space. The reason why I insist on having on just one is because I really want to limit the time babies spend on a bouncer. Swings are another must have item during the early stage as babies loved to be rocked and swayed. Some babies love side to side motion whereas some babies only calm down when rocked two and fro. Fortunately, baby swings come equipped with a series of movements for you to use and find out what suits your baby. MamaRoo is the ultimate swing, in my opinion. I love that it comes with 5 unique motions to choose from like riding in the car, kangaroo, rocking, wave and a tree swing. The swing is also compatible with Bluetooth, so you can control the motion, speed,and sound through your phone. The swing also plays music but you can also plug in your MP3 and play your own songs. It is super helpful to play white noise to calm your baby. The seat cover is removable and washable which is a great plus, cause we all know babies are messy. MamaRoo can be used right from newborn stage and has a weight limit of 25 pounds. Bouncers can come in handy when your arms need some rest and you have to get some work done. Bouncers can be soothing to babies and can also a safe place for them to rest or explore their surroundings. Choosing a non toxic bouncer is important because you don’t want chemicals off-gassing from synthetic materials. Over all, I highly recommend the Baby Bjorn bouncer if you are looking for a simple bouncer for your newborn. If you want something that grows with your child then Nuna Leaf and Nomi Baby looks very impressive. For swings, I think the only option available is the 4 Moms MamaRoo and it is an excellent choice to consider. If you know of another non-toxic swing, let me know and I will add it to my list. Did you get a bouncer or a swing or both? I had both and used them loved a lot. Which one did you get? Let me know in the comments below.